TFP Stainless Steel Fender Trim 06-10 Dodge Charger TFP Stainless Steel Fender Trim 06-10 Dodge Charger, Stainless Steel Fender Trim 06-10 Dodge Charger, Fender Trim 06-10 Dodge Charger, TFP CR-09 Fender Trim, Dodge Charger Exterior Parts, Dodge Charger Exterior Accessories, Dodge Charger Exterior Parts, [TFP CR-09 Stainless Fender Trim] - $89.95 : 3rd Strike Performance, Your Source for Late Model MOPAR Performance Parts and Accessories! 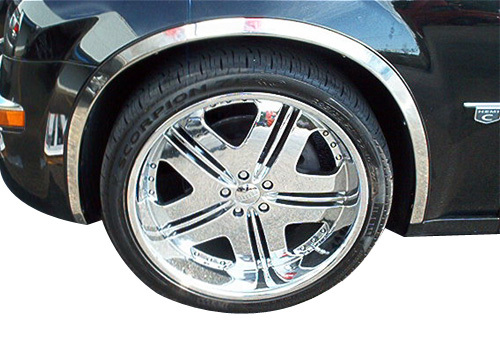 Improve the looks of your Dodge Charger with a set of TFP Stainless Steel Fender Trim. This fender trim is sold as a four piece set to provide coverage and protection for all four fenders. The no-drill mounting system allows for fast and easy installation. TFP backs this attractive accessory with a one year warranty. Not only does this fender trim enhance the appearance of your Dodge Charger, it protects your fenders as well. With its brilliant finish and simple installation, this accessory is an excellent investment.